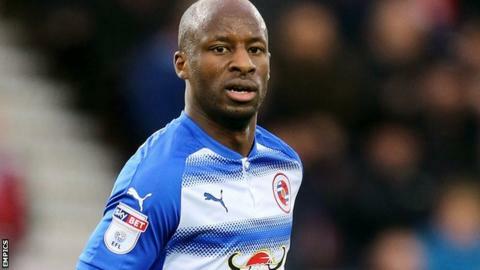 Reading forward Sone Aluko believes the squad have the fighting spirit and determination to turn around their recent poor form in the Championship. The Royals slipped to within four points of the relegation zone after Saturday's 2-1 defeat by Middlesbrough. Jaap Stam's side have won just once in 11 games since the start of December. "We've got to focus on the fine margins that are going against us at the moment and turn them in our favour," Aluko told BBC Radio Berkshire. Aluko, 28, has netted just two goals in his 26 appearances for Reading since joining from Fulham as the club's record signing in August. "I believe you make your own luck, so there's no hiding place in football," he said. "You've got to keep working hard. "I'm not alarmed with our position, it's just the reality and we have to deal with it. I certainly didn't come here expecting to be where we are, but we're going to be working hard to turn it around." Reading face a break from league action until 20 February when they travel to Nottingham Forest, which begins a run of six Championship fixtures in 18 days. "I'm confident we can get out of it," Aluko added. "It's what's between your ears that's key in these situations."